I have been catching squid from the shoreline for many years. But this is one of the longest I have net up. Haha…caught this longest “eel” from the jetty few night ago. Manage to pump up this 20 feet long bamboo pole from the sea. It got entangle with my line. Lucky my rod n line is strong enough to bring it close to the jetty before I use my hand to lift it up. Estimate it weight more than 30 kg. Think its a record in term of it lenght caught by any landbase angler. haha. Heavy rain in the late afternoon. I was undecide whether to head for the jetty. But after some hard thought, I go ahead around 7.30pm. Strong cold surface southern wind blowing endlessly. After setting up, it was squid searching but with the bad weather, it was hardly found. I was a bit regret about going there after feeling the cold wind. Tide begin to turn up after 10pm. Current was also better after this. The wind also improved and getting warmer. This boost up my feeling to carried on. As I was on leave so no problem of fishing late. Squid was still rare. I was also running out of bait as I had forgot to bring a packet of frozen tamban. Use two fresh squid but ended up no action and one was eaten up by sea lice and the other by a tie knot eel who coil up my rig. My last bait was a piece of cut belt fish. Decide if this gone than it time to packup. 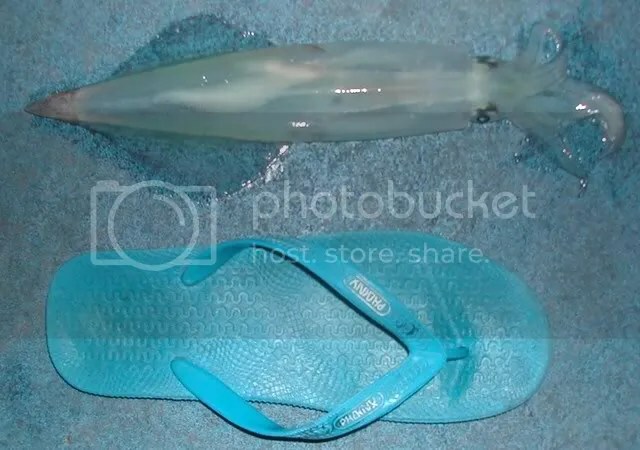 But luckily come a small cuttle fish. Scoop it up with my net and down it go with my hook. It already 1am. Current was turning direction. Suddenly, I heard my reel screech alittle. Rush to my rod and saw the tip rattling. Without hesitation, I strike…Was thinking could be a catfish but it take my line out running….hoho..this is defintely not a catfish. A RAY for sure….It head straight out along with the current. I start winding in line when it stop after a good run. The current push it to the left. I got to follow moving side way. Then it heading inward. 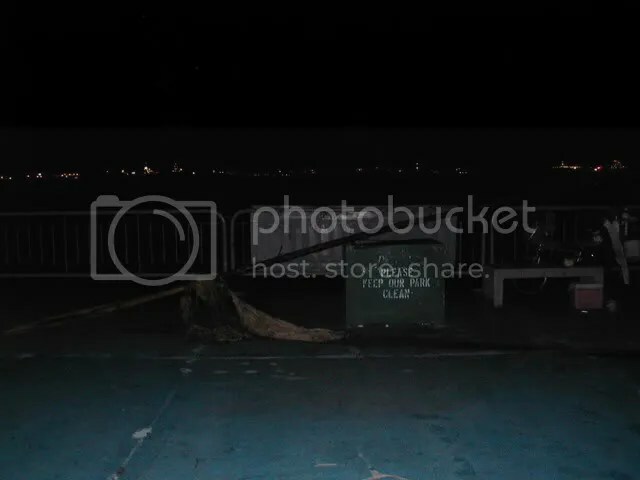 I move up to the railing and continue winding back line. Once it near the jetty, it surface and turn out again. After some twisting n turning, I finally able to control it. I used my rod to steer it near the jetty for gaffing. First a angler use a rope gaff but got entangle with my rig line as the fish still struggle around. Another angler bring a pole gaff n eventually manage to bring it up. It was a female ray and my hook was deeply hook inside the stomach. It weight 6.5kg after landed. The fish was cut into five pieces and share among those who help to land it. No baby ray was found. Fifteen minute later…Jerry Zipplex M4 rod pair with a Daiwa LD50 reel alarm was screaming. Finally this virgin rod open account. Again Seng was the first to strike. Jerry was a bit slow in reaction. He took over and the fish was taking line out. He gave a few pump on the rod when the fish stop. After awhile the fish was already on the water surface. I gaff it up and it weight 9.2kg. 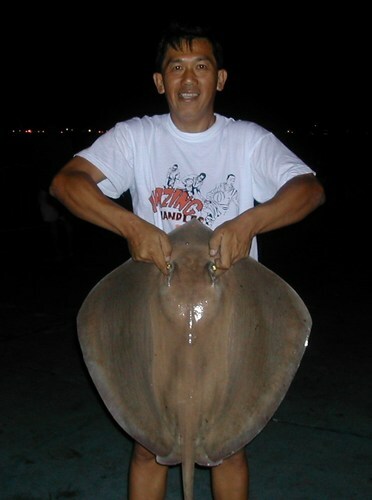 It has set this year bedok jetty up todate biggest fish and biggest ray landed record. He was shy to take a photo on his catch so I taken on his behalf.